Are you looking for evidence based roadmaps for leadership development and success? Check out our picks, the recent edition of the seminal Leadership Challenge, and the EQ Leader…both books and supporting online resources, are solid and helpful for consultants and leaders alike. The Leadership Challenge model has provided a framework for much of my leadership development work since 1994. 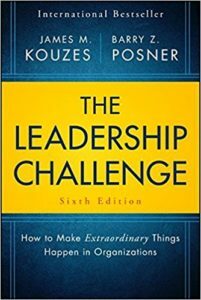 Kouzes & Posner approach leadership as a measurable, learnable, and teachable set of behaviours. Respected for its rigour, the Leadership Challenge framework grew out of research they started in the early 80’s. After conducting hundreds of interviews, reviewing case studies and surveys, they found there were five practices that extraordinary leaders engage in. Their work describes the behaviours that underlie the Five Practices of Exemplary Leadership along with concrete steps to develop the practices and the impact of these practices on others. Leaders appreciate the opportunity to receive feedback on these leadership behaviours using the Leadership Practices Inventory (LPI), the empirical measure of the five practices. Receiving this feedback within the context of a workshop or coaching session, continues to be one of the most valued components of leadership development work. Emotional intelligence continues to be a clearly identified area for development for most of my clients. Leaders are interested in developing the capacity to manage themselves in difficult situations, strengthen relationships and manage stress effectively. The EQ Leader is referred to as a roadmap to success for tomorrow’s leaders, providing an evidence based model for developing essential emotional intelligence skills. Stein provides a framework for the four pillars of successful leadership as well as examples and concrete steps for developing the competencies that underlie the characteristics within these pillars. Each chapter is summarized with a practical set of ‘Things to Think About’ questions. Dr. Stein is a clinical psychologist and founder of Multi Health Systems a publisher of scientifically validated assessments, including the Emotional Intelligence Quotient (EQ –I 2.0 ®), the psychometric assessment that measures emotional intelligence and how it can impact people and workplaces. Check out the resources here.